Yesterday we presented the first five of the world’s 10 spice blends you should know: adobo from Mexico, chili powder from Mexico, five spice from China, garam masala from India and jerk from Jamaica. Even if you won’t be cooking with them anytime soon, you should know them: They’re popular global, popping up in fusion dishes outside their native cuisines. The second half of the Top 10 include nori shake from Japan, pimentón from Spain, quatre épices from France, ras el hanout from Morocco and za’atar from the Middle East. Nori shake is made from sheets of nori seaweed (the type used to wrap sushi rolls), ground with with salt and sesame seeds. Nori is the seaweed, furi means shake. Beyond its traditional use as a rice seasoning, shake it on other grains, cooked vegetables, plain yogurt and dips. Traditional uses: Cooked rice seasoning. Quatre epices, a bend of cloves, ginger, nutmeg and pepper. Photo courtesy Silk Road Spices | Canada. Bittman’s recipe: Toast 4 nori sheets (one at a time) in a hot skillet for a few seconds on each side; coarsely grind them. Toast 2 tablespoons sesame seeds until golden; combine in a bowl with 2 teaspoons coarse salt, the ground nori and cayenne to taste. Note that unlike other blends, this keeps for only a week or so. Pimentón is the Spanish word for what is better known as paprika, a spice ground from dried New World chiles (Capsicum annuum). Although paprika is often associated with Hungarian cuisine, in Europe it was first used in Spanish recipes. The story has it that Christopher Columbus brought the ground chiles back to Spain at the end of his second voyage. It was served to King Ferdinand and Queen Isabella, who found it too hot and spicy; but local monks shared it with other monasteries. It spread throughout Spain, and subsequently to Hungary and elsewhere. Traditional uses: A universal seasoning for casseroles/stews, eggs, meats, salads, soups, tapas and vegetables. Traditional ingredients: Pimentón is usually sold as pure ground chile, not blended, in sweet, medium and hot levels. Bittman’s recipe: Combine ¼ cup pimentón, 2 tablespoons granulated garlic, 2 teaspoons salt and 2 teaspoons pepper. Before using, add some freshly grated lemon zest. 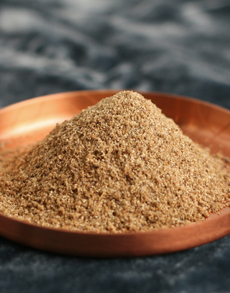 Quatre épices (kahtr-ay-PEECE) is a French spice mix that is also used in some Middle Eastern cuisines. The name literally means “four spices,” and they are cloves, ginger, nutmeg and pepper. Traditional uses: A universal spice, used for everything from soup and salad to broiled chicken and fish to vegetables. Traditional ingredients: The traditional version uses white pepper; black pepper can be substituted. Bittman’s recipe: Grind the following (no need to toast): 2 tablespoons each black and white peppercorns, 1 tablespoon allspice berries and 1 teaspoon cloves. Combine with 1 teaspoon ground ginger and 1 teaspoon ground nutmeg. There is no one recipe for ras el hanout: Every Moroccan spice merchant has a proprietary recipe, and the cooks who buy the spices debate who has the best version. The name translates as “top of the shop” and the mixture often includes 30 or more of a spice merchant’s best ingredients: whole spices, dried roots and leaves, ground together. Some of the 30 can be exotics as cubeb berries, grains of paradise, and rose petals; or more the more familiar ingredients listed below. The complex blend delivers many subtle undercurrents of floral, peppery and sweet. 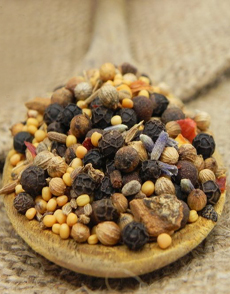 Traditional uses: As a dry rub for grilled meats, in starches (couscous, potatoes, rice) and traditional Moroccan dishes like b’stilla and tagines. Traditional ingredients: A “secret” recipe that can include anise, cardamom, cayenne and other chiles, cinnamon, coriander, ginger, lavender, nutmeg, mace, pepper, saffron and turmeric. Bittman’s recipe: Toast and grind 4 teaspoons each coriander seeds and cumin seeds. Combine with 2 teaspoons each ground cinnamon, ginger, paprika, turmeric and salt; add 2 tablespoons ground pepper. It’s a stripped-down version, but feel free to add what you like—you have 22 more slots available. Za’atar (also spelled zahtar) is a spice blend that is very popular in Middle Eastern cuisines, including Israeli. Za’atar is actually the word for Lebanese oregano, a member of the mint family Lamiaceaea, and known since antiquity as hyssop. The za’atar blend includes spices well-known in European cuisines, with the unique components of Lebanese oregano and sumac berries. The latter grow in the Mediterranean and parts of the Middle East. They impart a tart, fruity flavor that differentiates za’atar from other spice blends. Traditional uses: As a seasoning for meat and vegetables or mixed with olive oil and spread on pita wedges or flatbread. Add to hummus or for a modern touch, sprinkle on pizza (especially with feta cheese). Traditional ingredients: Marjoram, oregano, thyme, toasted sesame seeds, savory and sumac. Bittman’s recipe: Toast and grind 2 tablespoons each cumin seeds and sesame seeds. Combine with 2 tablespoons dried oregano, 1 tablespoon dried thyme, 2 tablespoons sumac, 2 teaspoons salt and 2 teaspoons pepper. Your homework: Plan to use at least one of these blends for the first time this week.